The Blue Devil Nation got the early word and broke the news that Marshall Plumlee [7-0, 215, Class of 2011, Christ School, Arden, N.C.] committed to Duke University tonight. Plumlee will join Mason and Miles for a rare three brother act in Durham. Plumlee called Coach Krzyzewski with the news that he was ready to be a Blue Devil this evening. Plumlee also chatted with Duke Assistant Coach Steve Wojciechowski about his decision and said he played a late role in helping him come to realize Duke was the fit for him. The Christ School product also phoned his Coach, David Gaines with the news and then called his two brothers before going to see his Mom in a joyous evening for his family. Plumlee also made a difficult call to Tony Bennett of Virginia, the runner up. Plumlee then started making calls to his family shortly thereafter and their camp was kind enough to give us the word first of his commitment to the defending national champion, Duke Blue Devils. He is happy to be a part of the Duke Family and stated he is ready to go to work to continue to get better. 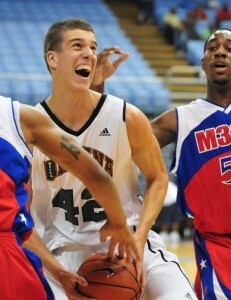 The youngest Plumlee joins Michael Gbinije and Tyler Adams in the class of 2011. Duke will now turn their attention to Austin Rivers who will play in this week's Peach Jam which BDN will once again cover. Stay tuned for an interview with the newest Dukie on BDN Premium. Sidebar - Up next for Marshall will be Minneapolis and Las Vegas on the AAU circuit.